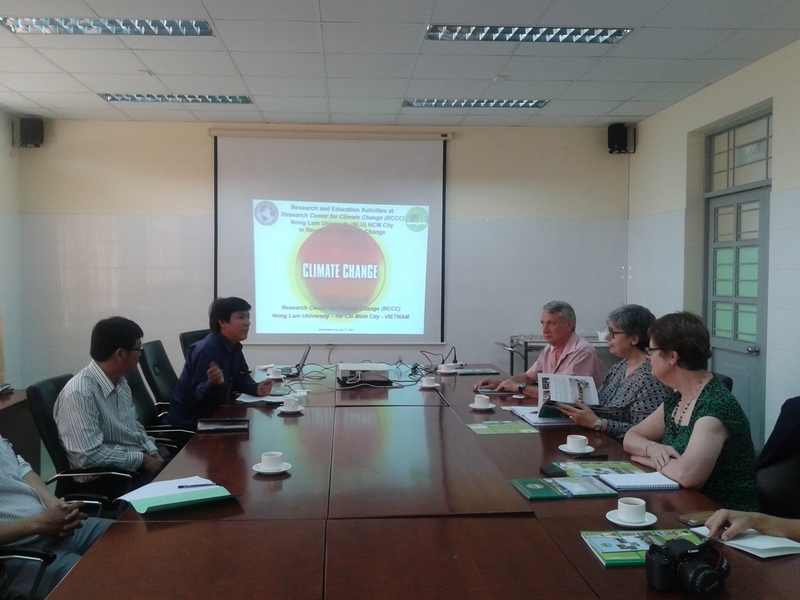 On 21st January, Research Center for Climate Change (RCCC) of Nong Lam University – Ho Chi Minh City held a seminar on climate change with 6 professors from Wollonggong University, Australia. The two sides discussed and shared useful information as well as their latest research on climate change in Vietnam. Especially Dr. Nguyen Kim Loi - Director of RCCC had an impressive presentation on this topic. Besides, there were also Vietnamese graduate students participating in this event. After the successful seminar, the representatives of the two institutions learned a lot from each other and hoped to have a good collaboration in the future. On December 12th, Nong Lam University – Ho Chi Minh City welcomed a European delegation of 5 specialists. The members of Nong Lam University were Dr. Duong Duy Dong, Vice President, Dr.Nguyen Ngoc Thuy – Head of International Cooperation and the Boards of Dean from Faculty of Food Technology and Faculty of Animal Science and Veterinary Medicine. The purpose of the visit is to launch the scholarship Eramus Mundus + for Vietnamese students. The specialists was hoping that there would be a lot of Nong Lam University to participate in this scholarship.